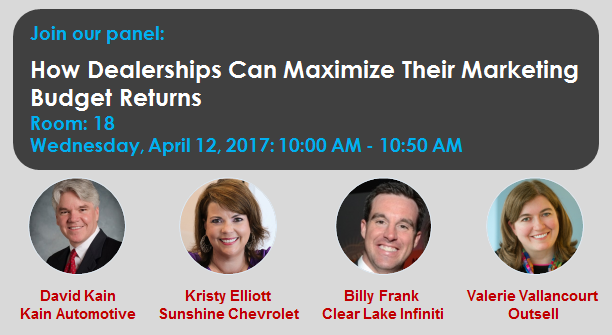 Outsell announced today that its Vice President of Marketing, Valerie Vallancourt, will moderate a panel about maximizing marketing ROI at the Digital Dealer 22 conference, taking place April 11-13 in Tampa, Fla.
Panel participants include Kristy Elliott, Dealer/Operator at Sunshine Chevrolet; Billy Frank, General Manager at Clear Lake Infiniti; and David Kain, President, Kain Automotive Group. As dealers move into the second quarter of 2017, now it’s a good time for them to reflect and re-adjust their marketing efforts. With a multitude of initiatives competing for a limited pool of dollars, dealers should to take a hard look at their marketing strategy. Many are ditching traditional marketing – such as newspaper and radio ads – and going completely digital. That’s because unlike traditional marketing, digital marketing can easily be personalized, works great on mobile devices, and most importantly, it’s measurable so dealers know what return they are getting for every dollar spent. Marketing initiatives that deliver the best return for dealers. The newest marketing technologies and benefits for dealerships. The criteria to evaluate digital marketing vendors. An overview of what dealers should be thinking about from a strategic marketing perspective. Moderator: Valerie Vallancourt, Vice President of Marketing at Outsell. Panelists: Kristy Elliott, Dealer/Operator at Sunshine Chevrolet; Billy Frank, General Manager at Clear Lake Infiniti; and David Kain, President, Kain Automotive Group.